Bodhgaya, place of the Buddha�s enlightenment.. The Place of the Buddha’s Enlightenment. The Bodhgaya tour must be booked at least one day before in advance. If you have any special requirements, please let us know, we will do our best to assist you! The tour includes a clean & comfortable, air-conditioned vehicle with cold mineral water supplied. 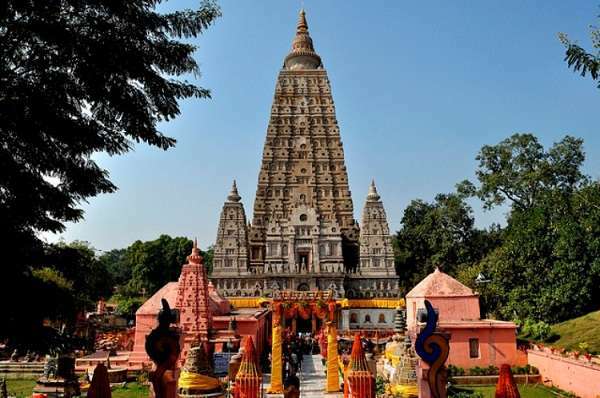 A knowledgeable & experienced tour guide will meet you at your hotel or guesthouse and accompany you to Bodhgaya and visit every location outlined in the Bodhgaya Tours. All toll taxes, state tax parking fees, the cost of the driver and the guide’s expenses are also included. Please Note: Accommodation, meals, entrances & temple tips are not included in this tour. As the tour is overnight, visitors are reminded to bring everything they will need with them at the time of departure. Other Places of interest: Gaya, the “city of the ghost’s cape”. Mythologically described as the last among the three pillars in “the holy bridge to heaven”, Gaya is eulogized as the most sacred place to conduct rituals to one’s ancestors. Gaya and its surroundings record a continuity of tradition from at least the 8th century BCE as narrated in the Vayu Purana. Gaya is an important religious location and is considered the most sacred place for Hindus - particularly for the ritual of Pind Dan. According to Hindu religious scriptures, every Hindu is expected to perform Pind Dan at least once in his lifetime in order to pacify his ancestors. The ritual has been in practice since the days of the Ramayana and even Lord Ram came to Gaya, accompanied by his wife Sita, to perform Pind Dan to his ancestors.